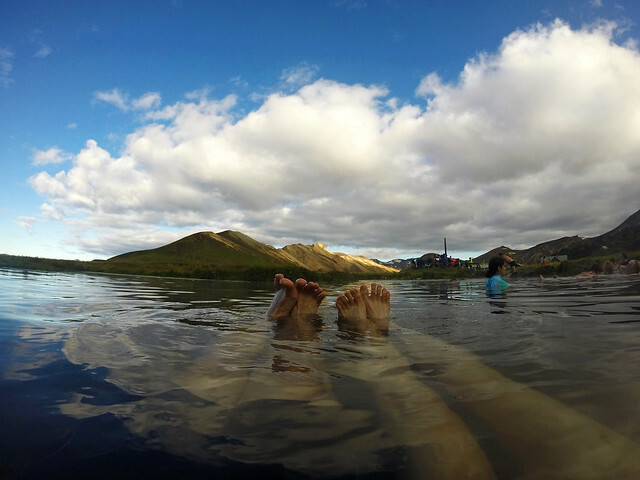 Why visit a natural hot pool? First, because it’s fun exploring them! We’ve been to the Blue Lagoon, of course, and we enjoyed our time there. But it’s not even comparable to the experience when we just stop in the middle of (beautiful) nowhere and dip into a natural hot spring. 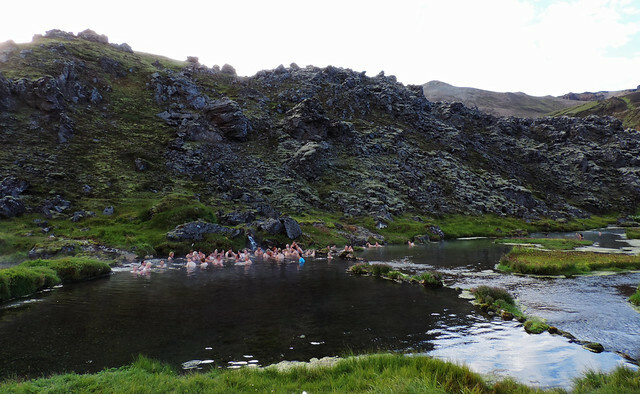 On the other hand, most of these natural hot pools are barely known and not so easy to access which makes them much less busy than the Blue Lagoon. They are also smaller. 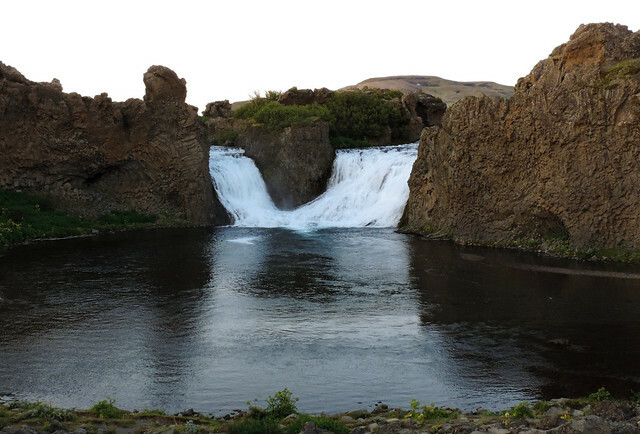 Now, Iceland has a lot of hot springs wherever you go, but be careful. Most of them are too hot to be suitable for a bath. But there are some that are just perfect! Their temperatures are warm and you can enjoy fabulous views while chilling out in these hot pools. They are clearly marked as suitable for bathing. Our favorite one is at Landmannalaugar. The natural geothermal hot springs of Landmannalaugar at the edge of Laugahraun lava field are located in the Highlands of Iceland. The Highlands are the most remote part of the country and they are the hardest to access. Its roads are marked with F that indicates they are 4WD roads and they are open only during the summer months. That means you have a bumpy ride ahead – if you have a 4WD car. 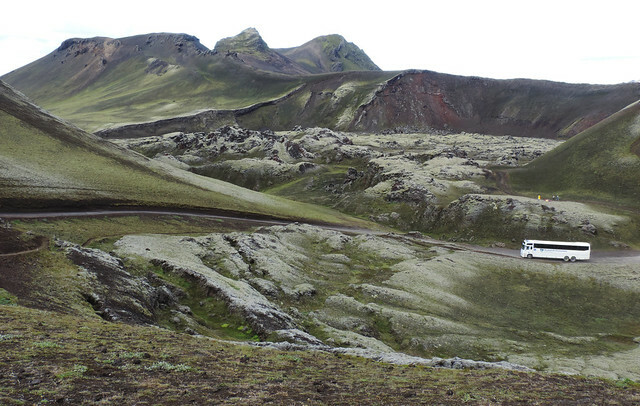 Believe it or not, the other option to get to Landmannalaugar is by local bus. This bus can cope with F roads and it can even cross small rivers. Since we wanted to explore several parts of the Highlands, we rented a 4WD car. 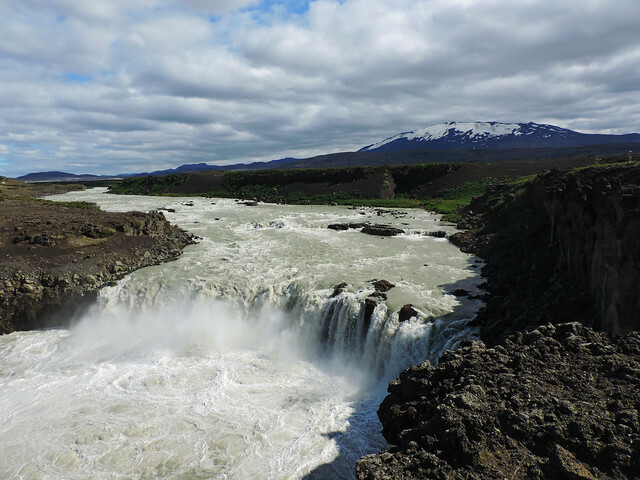 We left from Selfoss in the morning and took a turn on Landvegur Road (Road 26) first. Then we took a short detour on a narrow, dirt road to Þjófafoss. It’s an impressive, muddy waterfall and we could already see snow-capped peaks in the distance from there. As we continued our way on Road 26, our feeling that we are not even on planet Earth got stronger and stronger. 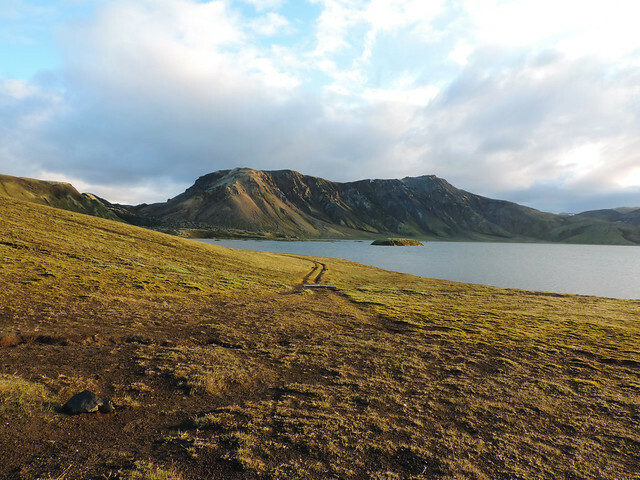 We soon reached the junction with road F208 – that’s the route to Landmannalaugar from the North. It was a bumpy road with jaw-dropping views! Whenever we found a marked pullout, we stopped to marvel at the otherworldly landscape. We wanted to do a short hike, as well, so we kept our eyes open for the power plant near Sigöldugljúfur Canyon. It was hard to say goodbye to Sigöldugljúfur, but Landmannalaugar was waiting for us. 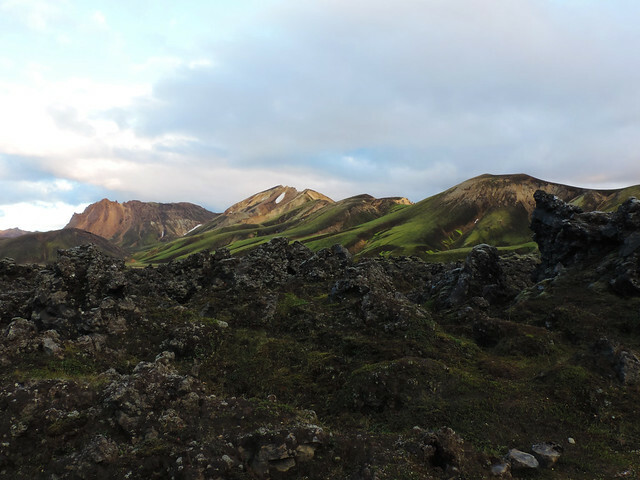 The landscape got even darker, we were surrounded by black lava rocks. But then colorful mountains appeared: yellow, orange and red were mixed with white as they were still covered by snow in August. We reached the river. 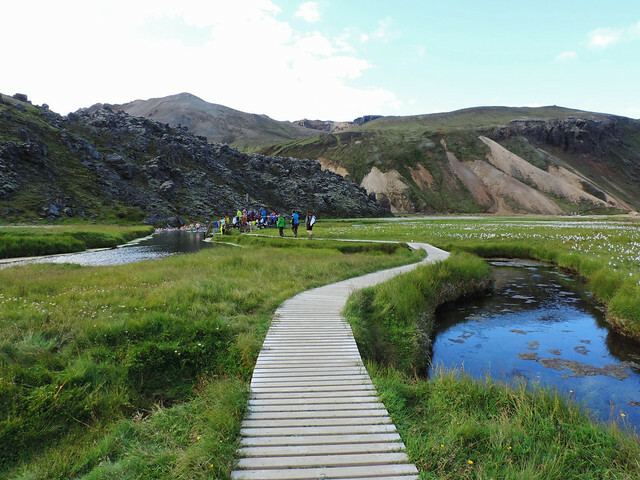 The only river that’s to be crossed to access the hot springs of Landmannalaugar. Since we didn’t have any experience in driving 4WD and especially not in crossing rivers, we left our car at the parking lot before the river-crossing. Yes, you can totally do that! The mountain hut and the hot springs are like 10 minutes walk from there and there’s a footbridge for hikers to cross the river in the summer. So we changed our bathing suits in the car, grabbed our wind jackets and towels and headed to the hot spring. We quickly noticed the boardwalk and a small group of people in the water from the distance. It didn’t take much time until we were soaking in the hot pool enjoying such a picturesque view that felt almost unreal. The colorful snow-capped mountains towered above the large meadow that was covered with wildflowers and tents. 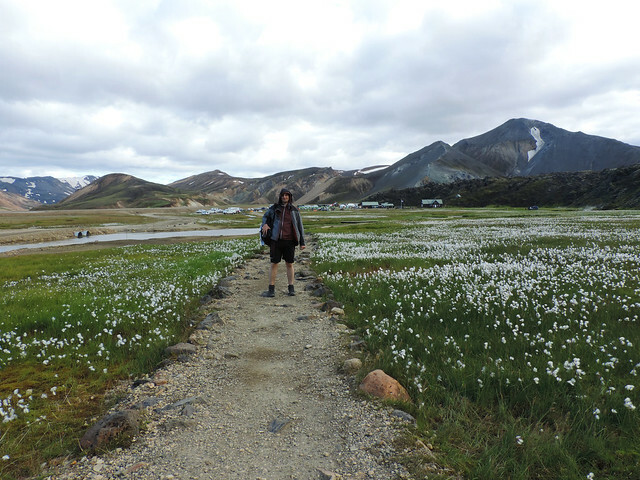 (There’s a campground at Landmannalaugar.) The black lava rocks right above the pool were in strong contrast with all the color and sunshine that surrounded us. The temperature of the hot springs is about 36-40°C and it gets hotter as you move closer to the black lava rocks. Basically, you can choose your ideal temperature by moving around in the hot spring. End your day with a waterfall! 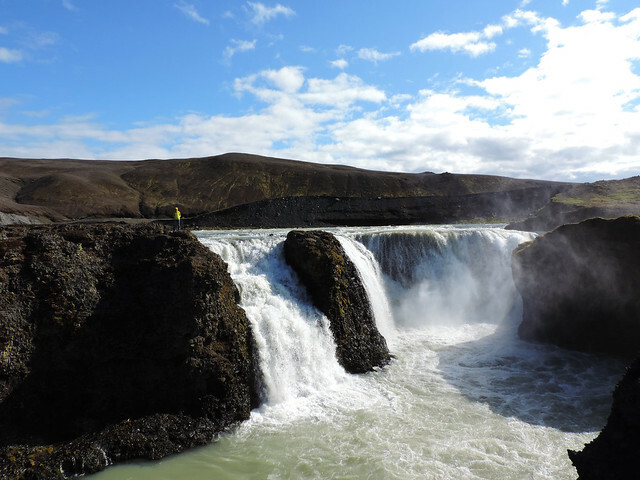 On the way back to our accommodation in Sefloss we chose Road 32 (instead of Road 26) to get back to the Rind Road so that we could stop at another lovely waterfall: Hjálparfoss. 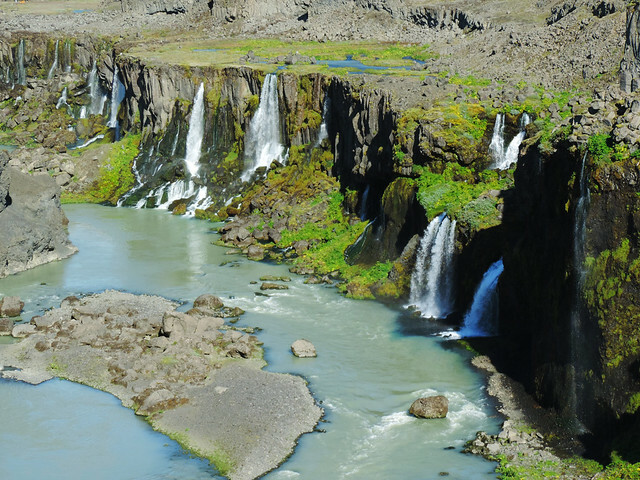 We had to start and finish our days with waterfalls, we were in Iceland after all. Have you ever bathed in a natural hot spring? Where?